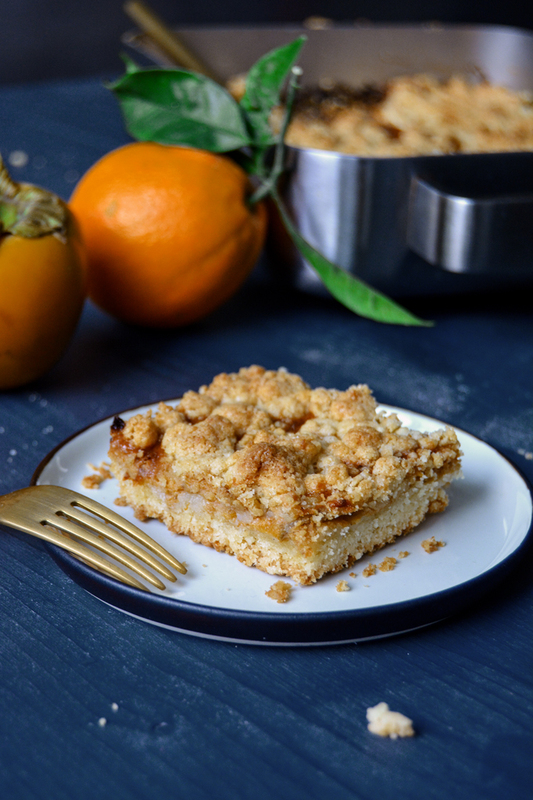 I had cookie-like streusel bars on my mind but I couldn’t help myself, they tasted too good, so I ended up cutting them into big pieces rather than petite bars. 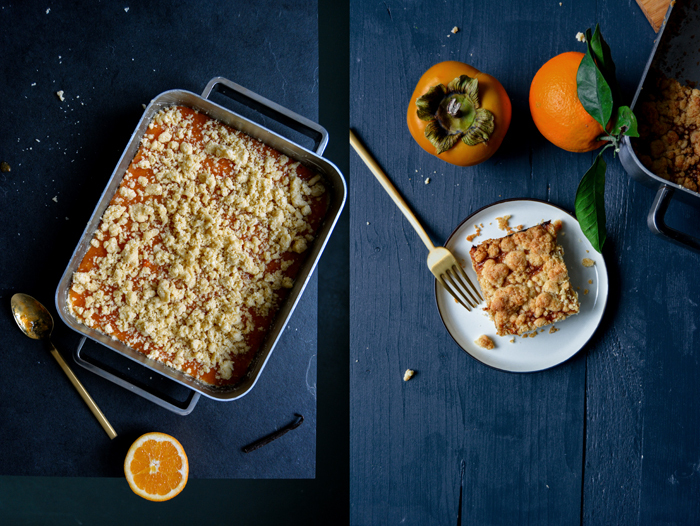 My idea was to combine a buttery shortbread base with crunchy crumbles and a sweet filling of puréed persimmons, orange juice and lots of fresh vanilla. 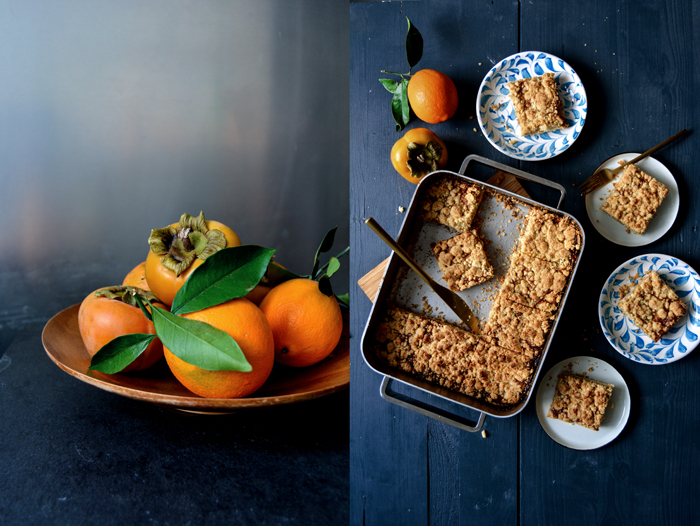 The candied fruitiness was distinct although it was hard to guess which fruit it was exactly if you hadn’t seen the overly ripe, jelly-like persimmons on my kitchen table. My boyfriend pointed this out with a hint of criticism in his voice. However, when one of our friends tried them he was particularly impressed by their fruity taste. He also couldn’t tell what fruit it was – but much like me – he didn’t care. There are more recipes on the blog but I think I have to stop here for now, this is more than enough to keep our jars filled. Preheat the oven to 180°C / 350°F (preferably convection setting). Butter a 23 x 28cm / 9″ x 11″ baking dish. For the filling, purée the persimmons, orange juice, honey, vanilla seeds, and salt in a blender or food processor until smooth. In a large bowl, combine the flour, sugar, vanilla seeds, and salt. Add the butter and cut it into the flour with a knife until there are just small pieces left. Add the egg and quickly rub the butter and egg into the mixture with your fingers until crumbly. Take about 2/3 off the crumbles and spread in the buttered baking dish. Push the dough firmly into the baking dish, especially along the edges. 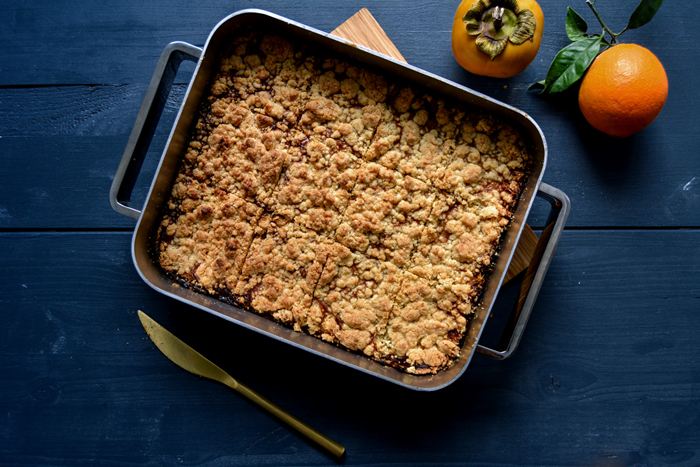 Spread the persimmon filling on top and even it out. Spread the remaining crumbles on top of the filling and bake for about 52 minutes or until golden brown (slightly longer using conventional setting). 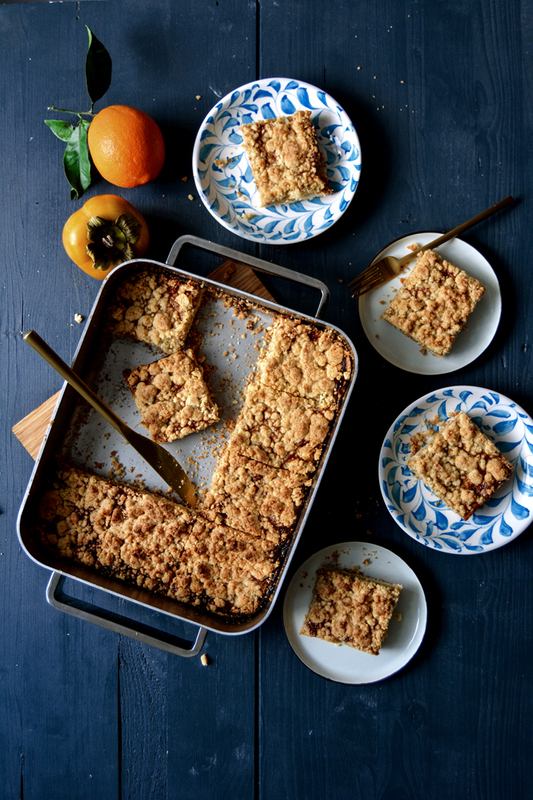 Let it cool for about 15 minutes before you cut it into streusel bars and take them out of the baking dish. 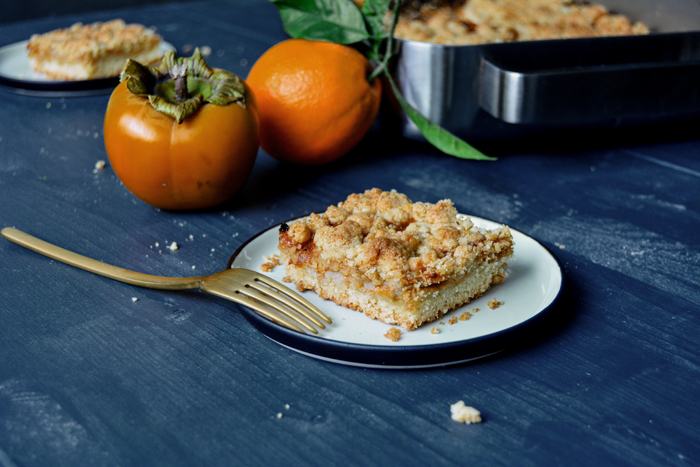 The streusel bars taste best on the first and second day. You can keep them in an airtight container for up to 4 days but they will soften. Unfortunatly i dont had enough time for photos, but next time. I wish you a great and contemplative and of course delicious christmas time. Hello ! First of all i gotta say I love your site. So inspiring! I really love your photos and I wanted to ask you, if you want to share what settings you use on your camera? still playing with my “what to cook for the holidays list”; can’t wait to try this out, meike. 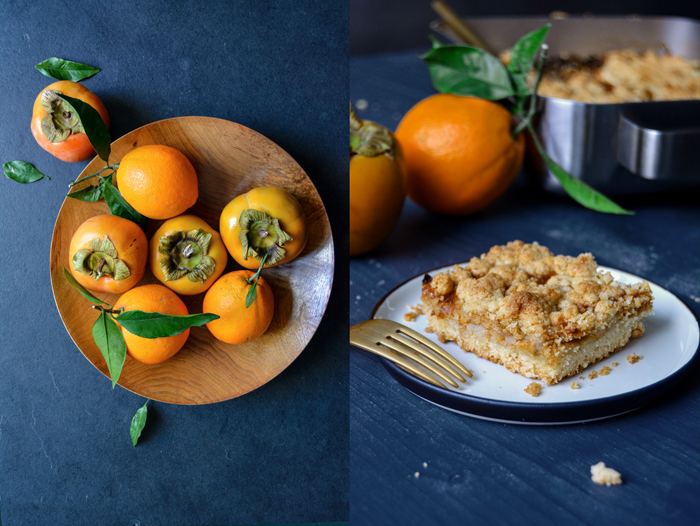 Meike, I am so excited about this recipe…I have never cooked with persimmons, and I saw some luscious looking ones at the market Saturday! I am going to try this!! Thank you, too, for the cookie recipes to try for my Christmas cookie basket! !